Punkie is going to need a helmet. Now that he’s crawling and pulling himself up on tables and whatever else is nearby, he is banging his head continuously. He’s top-heavy too, so it seems like a foregone conclusion that he’ll careen around the house head-first for a while. As a child of the 70s and 80s, I’ve done my fair share of scoffing at the bike helmet law and what seems to be a general desire to wrap kids in bubble wrap. I totally get it now. 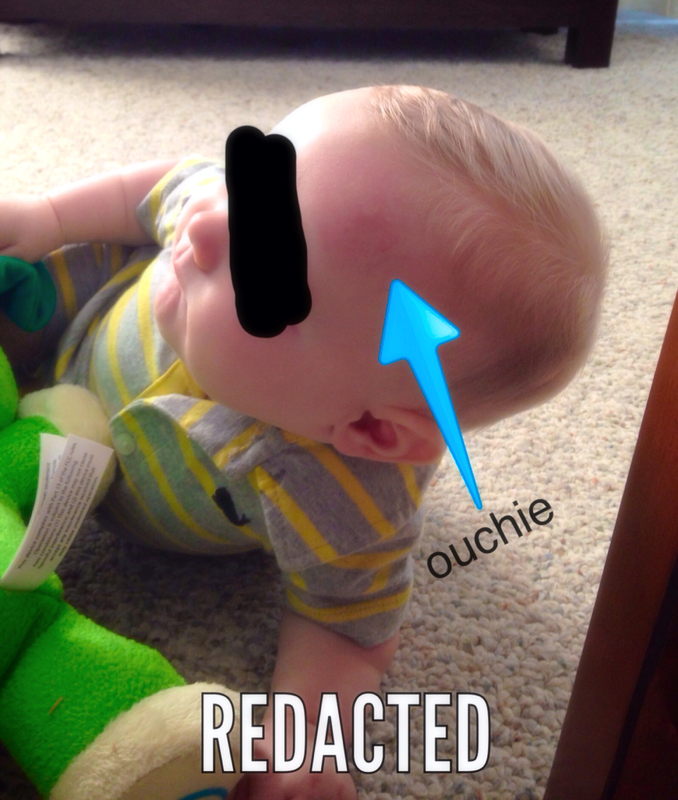 Here’s a photo of his first injury. It scared the stuffing out of my husband and me. We think he was trying to reach up to grab the curtain to pull himself up and missed. Instead, he slammed his forehead into the wall. He let me put some ice on it for a while and there is just a small mark now. I hate to break the news to him, but the wall might be the least of his worries. I installed that curtain rod myself and I’m not entirely convinced it will survive Punkie’s toddlerhood. This entry was tagged helmet, lawyer mommy, mommy blog, toddler. Bookmark the permalink. I agree – I don’t think I’d be doing my kid any favors by protecting him from everything… as much as I want to. Limited risk-taking is very healthy.